Municipal street sweeping is a necessary service that every community must have to remove the debris brought about by everyday living. This service does a lot more than we appreciate — besides making the streets tidy and beautiful, street sweeping also helps control pests. Municipal street sweeping also safeguards the environment by properly disposing of materials such as non-bio-degradable plastics and other types of non-degradable trash. To get an idea of how much trash is picked up, here’s an article that details the mountain of debris, dirt, and trash encountered by the municipal street sweeping services. To understand the passionate love-hate relationship between the public and the municipal street sweeping, in this post, we will focus on street sweeping. Life would be difficult in cities and urban areas if street sweepers had never been conceived. The safest and cleanest cities thrive because they have a workforce that regularly removes trash and debris from the streets and ensures that they are properly disposed of. Neighborhoods look great and very attractive because street sweepers take the time to clean out all the eyesores and litter. If you live in a neighborhood with an efficient street cleaning service in place, you should never take it for granted because someone wakes up earlier than you to clean the streets on your behalf. Neighborhoods look attractive because street sweepers take the time to clean out litter, debris, and accumulated dirt. If you live in a neighborhood with an efficient street cleaning service in place, don’t take it for granted because someone wakes up early to clean the streets for your benefit. Cities and neighborhoods that are considered clean and livable often have municipal street sweepers working at all hours to ensure it is so. Homes in such neighborhoods enjoy higher market value because of enhanced curb appeal. Consistent street sweeping, coupled with effective environmental conservation, are a sought after criteria when evaluating the “livability” of a community. While municipal street sweeping has its pros, this service is not devoid of cons. For starters, in many communities and cities, people have to park their cars on the street. Residents find it inconvenient to have to park their cars somewhere else during the street sweeping day. The inconvenience may seem inconsequential but considering the number of people affected, there is a lot of complaining. No one ever likes to clean up after someone else, even the municipal street sweepers. It would be great if no one litters. If there were no litter, there would be no need to spend money on municipal street sweepers. However, funding for the labor and equipment for municipal street sweeping comes from taxes and frankly, people are not fond of paying taxes. People do enjoy the fact that a municipality takes the responsibility to clean the streets, but no one likes paying taxes to meet the cost of this service. Street sweepers are a vital part of the existence and normal operation of cities and urban neighborhoods; without them, organized urban societies would struggle with health and environmental challenges. We need them and manage the pros and cons for what they do to keep our societies safe and functioning. Looking to keep your community clean and looking good? 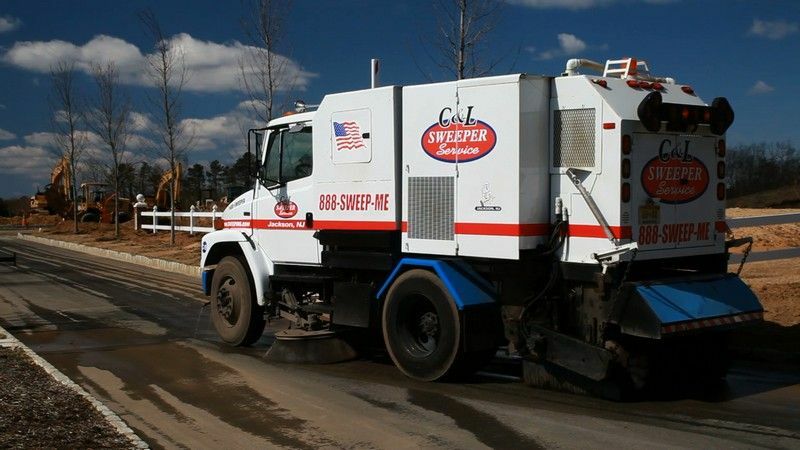 Call C & L Services at 732-886-1940 to discuss your needs for municipal street sweeping. Fresh seal coating makes the pavement look beautiful and new! As soon as the hot freshly laid asphalt on your parking lot begins to cool down, the aging process begins. From this point on, the elements and use begin to wear the parking lot down. The sun’s rays begin the oxidation process, water starts penetrating the tiniest cracks, oil seeps further down, and temperature variations essentially wear the surface bit by bit. The secret to extending the life of any paved surface is to seal the pavement. And the success of the seal coating project is how it is planned, prepared, sealed, and finalized. 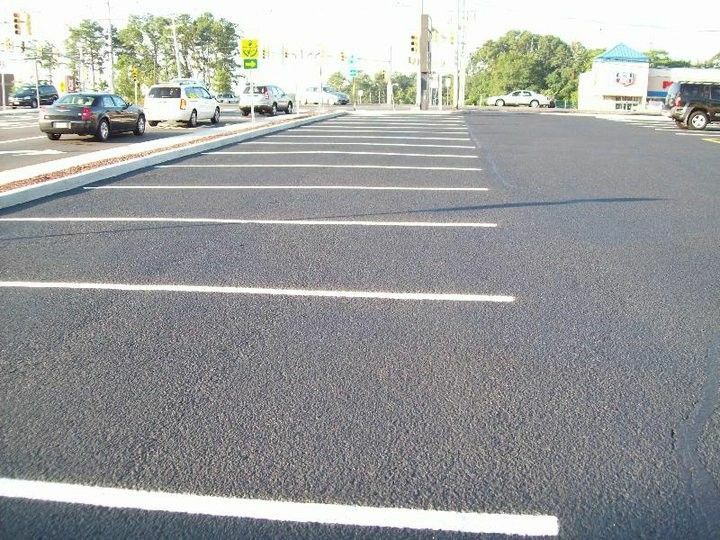 If you are considering seal coating your parking lot, there are a number of vital questions you must ask your contractor to ensure that the job is done right the first time and to maximize the longevity of the coated surface. Step 1: What Planning Is Needed Before The Seal Coating Project? When will be the best time to seal coat the lot? When is the lot busiest and when is it less used? What are the best materials to use based on lot traffic, my budget and seasonal weather? It is vital that you choose a seal coating contractor who is meticulous about planning the ‘whens’ and ‘hows’ of seal coating and involves you in the planning process. Step 2: What Is Needed To Prepare for The Seal Coating Project? Asphalt must be cured and solid for at least 30 to 60 days after installation before sealing. A seal coating professional can use simple tests such as pouring clean water on the surface to see whether a thin oil film forms on the surface to determine if the parking lot is sufficiently cured. What cracks need to be filled (seal coating should not take the place of crack filling)? Which holes need to be filled and compacted? Is there damage to the pavement that must be repaired? Should you repave a damaged section of your lot? Here’s an article we published titled, “5 Clear Signs That You Should Invest In Paving Services”. The article will help you determine if you should repair or repave. While you compare various contractors, ask them about types of materials and application methods they will use before making your mind up. The right contractor should answer these questions to your satisfaction as well as explain their approach to setting up barriers and barricades and why. To finalize your preparation, the lot surface needs to be thoroughly cleaned, debris removed, and professionally swept by an experienced parking lot sweeping team. Step 3: How Should the Seal Coating Project Be Managed During The Application? When it comes to ensuring that your parking lot is properly sealed, take some time to evaluate the different approaches that your chosen seal coating contractor uses, the seal coating material, and the number of coats. We recommend that your contractor applies two coats and apply the material according to manufacturer recommendations. Step 4: What Should Be Done After The Lot Is Sealed? After sealing, the time needed to dry depends on the weather and having a contractor that can properly coordinate your property to minimize the inconvenience to residents or tenants. C & L Services is particularly skilled with seal coat coordination and can arrange for an accessible surface in a little as three hours. 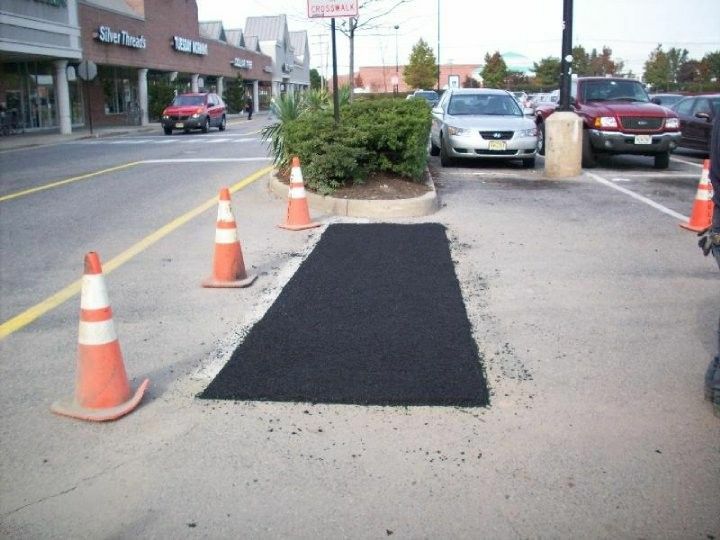 Also, ensure that you choose a contractor that can provide line striping for the parking lot after the seal has dried. Finally, ask your chosen contractor for a meeting to follow-up and appraise the job shortly after the project is finished. Still have questions? 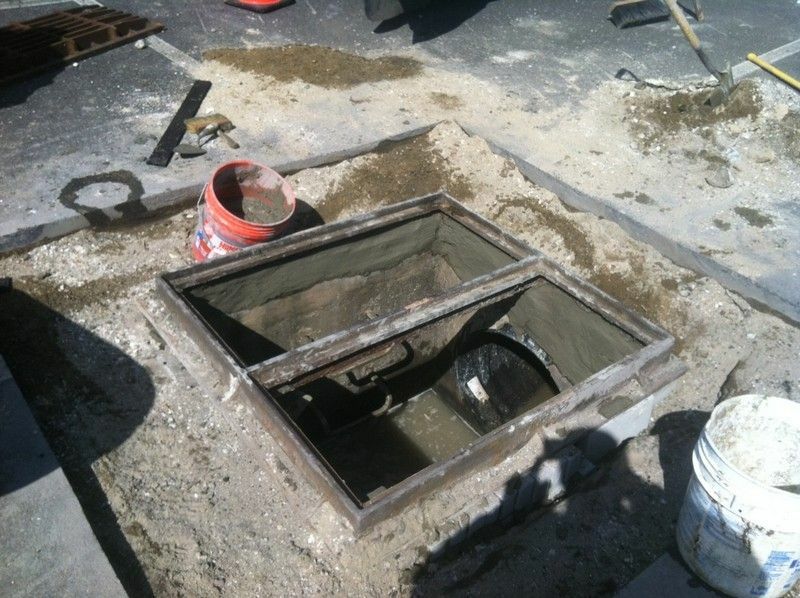 Call C & L General Services at 732-886-1940. We’ll be glad to answer your questions for your parking lot seal coating project. Asphalt repair can be costly – anyone who has a large pavement or parking area to maintain will be the first to admit. Whether the repair involves patching a hole, a crack or replacing the entire surface, an asphalt repair demands that the job be done properly the first time by a contractor with experience and a track record for success. However, the thought of replacing an entire asphalt surface creates anxiety to both property owners and businesses. When cracks appear and grass starts sprouting on old asphalt, it can be difficult to decide whether to save money by patching the bad spots or just replace the entire asphalt surface. The factors in the decision to repair or replace an asphalt driveway are more complicated because while a quick fix may be cost effective, a permanent solution such as replacement may be better in the long run. Here are five major considerations to help you decide what the best option for you is. Asphalt Repair – Your Budget and How Much Do You Have to Spend? If there are enough funds set aside (reserve fund assets) to replace the asphalt surface, then you have more options depending on the damage, condition of the asphalt surface, and what results you expect. With little to no budget, you may be forced to consider a temporary asphalt repair that could extend the life of the pavement or driveway by weeks or months. It is important to involve an asphalt repair company in the process to determine which is the most economical option, especially if you are carrying out the repair on a tight budget. No matter how well you take care of your pavement, the traffic passing over it and constant freeze-thaw cycles will certainly cause damage at some point. Damage may show as narrow cracks you can live with or potholes that an asphalt repair company must repair before the pothole grows bigger. Depending on how severe the damage on the surface is and the risk it poses to the rest of the surface, you can determine how much individual areas cost to repair and compare with the cost of an overall replacement. Typically, cracks over a quarter inch on asphalt surfaces may show signs of deeper damage that liquid crack-fillers cannot fix. You cannot ignore the fact that asphalt will age and deteriorate over time. Old cracked asphalt surfaces can have deep deterioration beneath the surface that could make them very difficult to repair. Attempting to repair severely aged asphalt may be ineffective because the older asphalt may have substrate problems causing issues with cohesion of the new pavement. Potholes are bound to re-appear where the surface is patched or where the old and the new surfaces overlap. In cases where the surface is very old and damaged, an expert would recommend an overhaul of the pavement. However, newer pavements with little signs of cracking and flaws can be patched creating a more permanent solution. A professional asphalt repair company would use a patching material to repair damage on an asphalt surface to fix against further damage. When water intrusion starts to create new cracks and deterioration between the old material and the new one, this could be a sign that replacement is necessary. The damage on a repaired surface is often made worse by heavier traffic exerting constant pressure on the patchwork. This means busy surfaces may require urgent or more frequent repairs to prevent further damage to pavement or vehicles traveling on the pavement. If you are looking to repair parking lot spaces, a patch may be fine for an extended period if the repair is done effectively. However, a thoroughfare in the parking lot or the entry/exit point may demand a replacement evaluation. Many property owners are concerned with the idea of replacing a parking lot and are quick to choose a quick fix rather than deal with the root of the problem. The decision to apply a quick fix or find a lasting solution to asphalt surface damage is often dependent on how quickly the surface needs to be replaced. The most cost-effective solution may depend on how extensive the damage is but your budget and personal preferences will determine what the best option is. Would you like help with the decision? Give us a call at 732-886-1940. 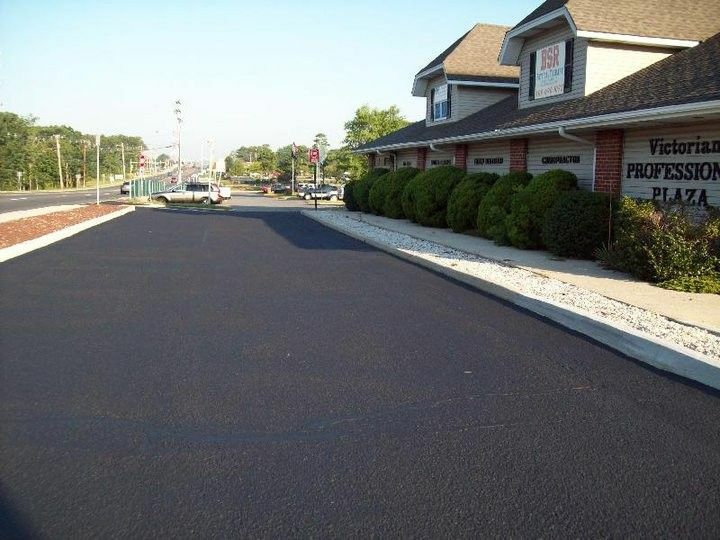 We are a professional asphalt repair and replacement company. We can help you by viewing your pavement, offering suggestions and taking the right approach for your asphalt repair.